Ambika Rajgopal of Saffronart posts about Rina Banerjee’s work at the Seven Sisters exhibition in Jenkins Johnson Gallery, San Francisco. 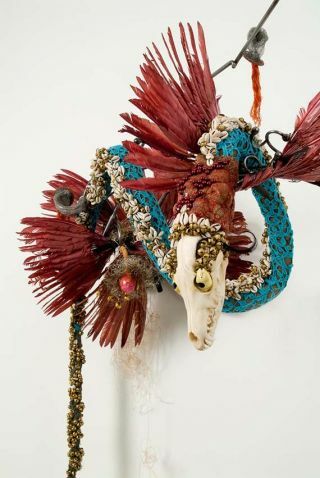 London: Rina Banerjee is one of the eight artists on view at the Seven Sisters exhibition at the Jenkins Johnson Gallery, in San Francisco. The other artists displaying their works are Carrie Mae Weems, Mickalene Thomas, Patricia Piccinini, Camille Rose Garcia, Kenyatta A.C. Hinkle, Toyin Odutola, and Vanessa Prager. At the heart of this exhibition is the sororal significance of the constellation Pleiades, where each of the seven stars represents the seven daughters of Atlas and Pleione. Each of the seven sisters have a mythological significance in Greek lore. These artists represent the sisterhood of femininity, which binds together the social fabric of our culturally heterogeneous society. Through works in diverse media like painting, drawing, sculpture and video, these artists represent the penetrative influence of the female identity. The works also interrogate personal identity and its correlation with themes like migration, race, gender, politics and heritage. Indian born, New York-based artist, Rina Banerjee has had a long drawn history with investigating mythology, role of culture, fairy tales, anthropology and ethnography. 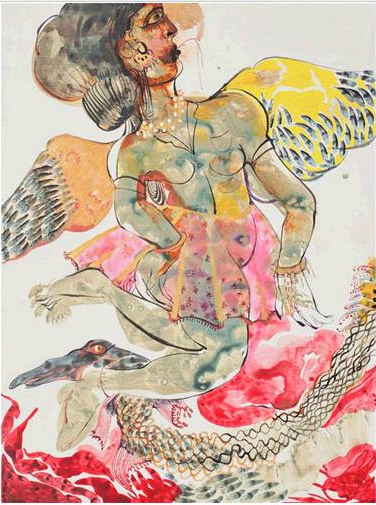 On display in the exhibition are Banerjee’s works on paper and panel, where her visual language examines mythology and fairytales. These concepts are fused with larger questions of migration, mobility of tourism and global commerce and how they influence personal identity. My work deals with specific colonial moments that reinvent place and identity as complex diasporic experiences intertwined and sometimes surreal. Banerjee was born in Calcutta, India and relocated to the UK with her family, before settling down in the USA. She pursued a Bachelor of Science degree in Polymer Engineering at Case Western University and then worked as a polymer research chemist. Banerjee decided to abandon scientific pursuit in lieu of a more symbolic and personal curiosity, which lead her to pursue a Masters of Fine Arts from Yale University. Banerjee has exhibited in a number of different art fairs and exhibitions, most recently appearing in Smithsonian‘s Arthur M. Sackler Gallery in Washington, 7th Asia Pacific Triennale of Contemporary Art and the 55th Venice Biennale of 2013. Despite her multicultural upbringing, there is inherent nostalgia for her cultural identity. Banerjee employs the use of heritage textiles, cultural motifs, colonial and historical objects, in order to rekindle a cultural association with the country of her origin. While using a visual language steeped in antiquarian heritage, Banerjee examines questions, which are relevant on a larger and more global level. 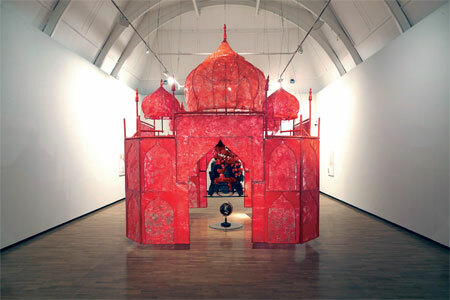 Banerjee uses an aesthetic that is hyper ornamental and relies on the narrative power of objects. These versatile objects, from touristy trinkets and thrift store bric-a-bracs, to bones, shells, feathers and textiles, form decorative aggregates that represent her transcultural perspective. The show also features other artists who reframe the boundaries of personal identity. Similar to Banerjee, Camille Rose Garcia tackles the issue of fantasy. But the fantastical dreamscapes she paints are dystopian surrealist visions, replete with hollow eyed characters painted in a cartoon-like manner. She demonstrates the failures of capitalist utopias. 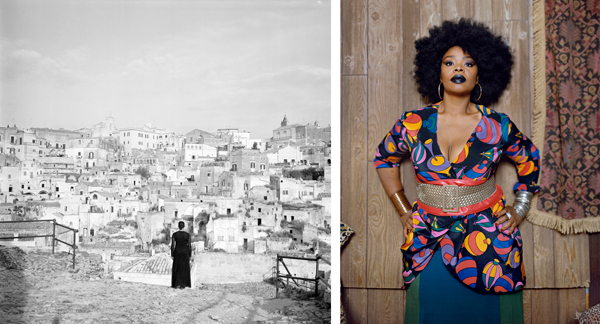 Other artists like Carrie Mae Weems and Mickalene Thomas, through their art practice, answer questions relating to female black identity and beauty, through histories of racism, class and politics. The exhibition is on view from October 3 through December 7, 2013. For additional information, please access the gallery website.